Although Phelps Lake is the highlight of this hike, this loop provides an option to explore the wooded and boulder-laden moraine that confines the lake. The trail begins at the Laurence S. Rockefeller Preserve amongst wetlands and sagebrush meadows with stunning views of the Tetons. You quickly enter into the forest and meet up with Lake Creek. Stay along the northwestern side of the creek as you hike up through the trees on the Woodland Trail. The trail wanders up through the varied forest as it crosses the Moose-Wilson Road and reaches the intersection with the Boulder Ridge Trail. Take a right onto the Boulder Ridge Trail heading east. This trail travels across the moraine through more trees on its way to the shores of Phelps Lake. Along the way, this trail forks in the middle. You can take a left to walk through a boulder field full of erratics (large rocks deposited by glaciers), or take a right which leads you out along the edge of the ridge with a nice vantage looking north. Either way, the two equidistant options end up at the same place, rejoining before dropping down to Phelps Lake. Head west on the trail that follows the shoreline to the outlet of the lake. The grand opening of Death Canyon creates the perfect backdrop to this gem of a lake. After enjoying the view and relaxing on the shoreline, continue on, crossing over the creek past more wetlands. Keep an eye out for the variety of birds that inhabit the area. The trail for Aspen Ridge takes off to the left just past the trail junction with the Lake Creek Trail. 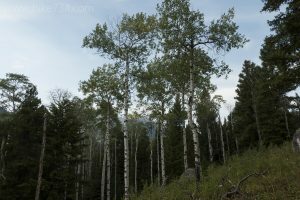 The Aspen Ridge Trail climbs up on the moraine strewn with aspens. Views looking east are dominated by Mt. Hunt. The trail follows the ridge down through the trees to a small stream, then back up onto the moraine where it works its way down to Lake Creek. Follow the Lake Creek Trail, which closely parallels the creek, all the way across the road and back to your car. Trailhead: Take the Moose-Wilson Road south from Moose to the Laurence S. Rockefeller Preserve. The trailhead is located in the parking lot.